RIGA, Feb 12 (LETA) - In relations with Russia, Latvia maintains a strict and united EU diplomatic and sanctions policy, Foreign Minister Edgars Rinkevics (New Unity) told LETA, commenting on a report about Latvia’s relations with Russia, Belarus and China, which the government heard behind closed doors on Tuesday. The minister said that it is the Foreign Ministry’s traditional practice to inform each new government about basic policies regarding these countries. Ministers came up with their own questions, ideas and opinions at the meeting, Rinkevics said. The foreign minister indicated that this practice helps Cabinet members in their practical work and to formulate their political course. “There are specific matters concerning the EU-Russian, EU-Belarusian and EU-Chinese dialogue. Nothing changes fundamentally. As far as Russia is concerned, there is a two-way approach, meaning that there are serious disagreements about compliance with international law, the unlawful annexation of Crimea and events in Ukraine,” the minister said. 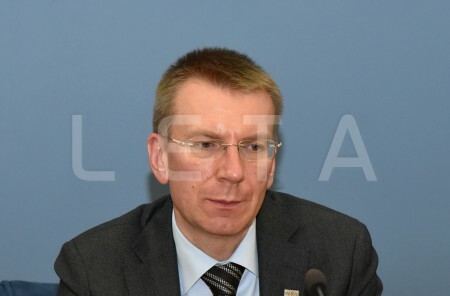 On these issues, Latvia backs the European Union’s (EU) firm and united diplomatic and sanctions policy. When it comes to practical matters, there is a number of issues that can be dealt with and the “work amplitude there is much more nuanced”. “In the next coming months, we will appoint a Latvian co-chairman of the intergovernmental commission for cooperation with Russia. Traditionally, it has been the transport minister. I heard no objections from Transport Minister Talis Linkaits (New Conservative Party),” said Rinkevics. Meanwhile, the situation with Belarus is even more nuanced, Rinkevics said. Bearing in mind business interests, economic cooperation and recent discussions in the EU and the wider world, relations with China were also discussed at today’s Cabinet meeting. “It is well known that there is a number of traditional issues, like the Dalai Lama, Tibet and the issue of Taiwan. This is a range of rather sensitive issues, and we informed the colleagues about Latvia’s policies on these issues,” Rinkevics said.